Antique - Wetley China by Sampson Smith of Longton, England - Milan Pattern #9386 - Made in 1923 through 1941 - Total of (20) Pieces. 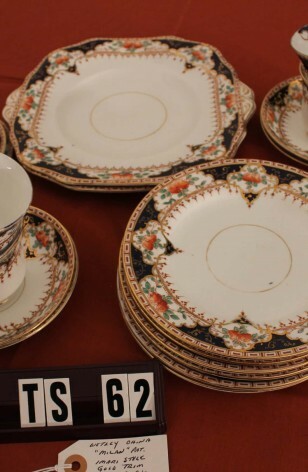 The "Milan" Pattern #9386 by Wetley China, is an Imari Style. There is a Cobalt Blue Border with 22kt Gold Scrolling. Gorgeous Rust Orange Roses, Bright Green Leaves, and an amazing amount of 22kt Gold used on Rims, Verge, and in the Pattern itself. This (20) Piece set consists of (6) Trio's (Cup, Saucer, Tea Plate and 2-Cookie Platters). The Tea Set is Antique, but shows very little wear, obviously well cared for by it's original owner.